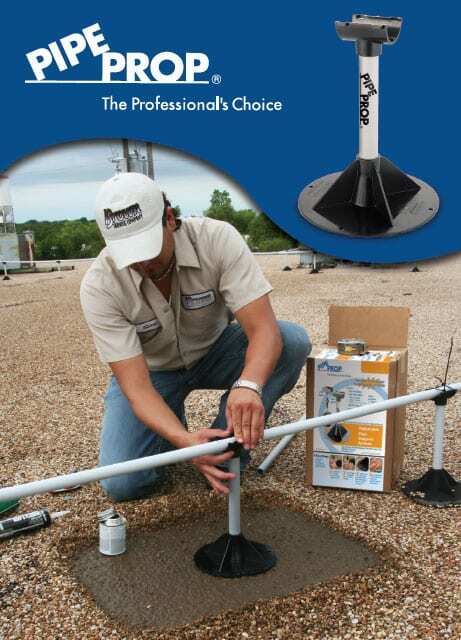 Roofing contractors, electricians and plumbers alike rely on the Pipe Prop pipe support system daily to increase their efficiency and productivity. Pipe Prop is known for its versatility in the work place and is regarded as the best choice for pipe support structures today. The Pipe Prop adjustable pipe support system is the perfect choice for HVAC condensate drains, gas supply lines and electrical conduit piping. Roofing contractors use Pipe Prop to protect the roof and elevate all types of piping, making for a safer work environment. Electricians know that they are less likely to face power outages when supporting conduit with this unique system. Plumbers routinely support gas supply lines with the Pipe Prop. HVAC contractors choose our product to assist with adjustable gravity flow drainage on commercial roofs and in residential attics. Building Managers/Developers rely on a pipe support and pipe stand system to protect their investment. The key design element that allows Pipe Prop such flexibility is its ability to accommodate up to 1½-inch pipe (Model APS-1) and from 1½-inch to 2½-inch pipe (Model APS-2). There is no loss of strength or security with either model, no matter what size pipe is supported. Call us at 1-888-590-0120 to order or find a local distributor near you. Once you have your Pipe Prop in hand, follow these easy-to-follow instructions to complete your customized, secure model for dependable pipe support. Pipe Prop’s versatility and flexible design allows it to be used in a variety of ways by industry professionals nationwide. Field data shows just how well the Pipe Prop performs in various challenging conditions including high winds, heat, and harsh weather.